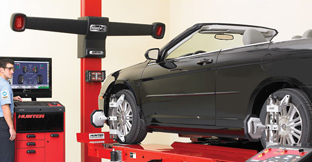 Make sure your vehicle is in line with a wheel alignment from Rolison’s Firestone. If your vehicle feels unstable, a proper wheel alignment can improve driver safety, create a smoother ride and increase fuel efficiency. An out-of-balance tire and wheel will typically create a vibration or shake that becomes progressively worse as the vehicle’s speed increases. The speed at which the vibration first becomes apparent will vary depending on the size and weight of the tires and wheels, the size and weight of the vehicle, the sensitivity of the steering and suspension, and the amount of imbalance. The vibration or shake usually starts in at 40 to 50 mph and increases in intensity as the speed increases.